In the first part of our blog post, we mentioned a few ways in which we can all, as individuals, reduce personal food waste. Read on to find out more steps you can take towards creating a better environment. 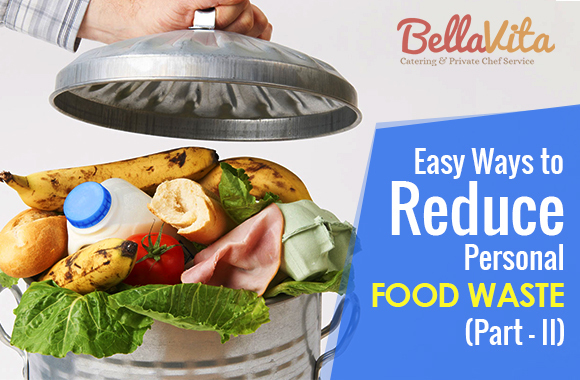 One of the most important steps towards reducing food waste is to make sure all foods are properly stored. This helps keep them fresh for a long time. Here are some food storage ideas that can help you. 1. Apples, grapes, berries and other citrus fruits can be stored in the fridge. 2. Tomatoes, pears, peaches, plums, nectarines, melons, avocados and apricots can be stored outside the fridge until they are ripe. They can then be stored in the fridge. 3. Pineapples, papayas, mangos and bananas can be kept outside the fridge. 4. Remember to store bananas, tomatoes, citrus and apples by themselves as they emit ethylene gas which can spoil them and other nearby food items faster. Store all dairy products in the cooler part of the fridge like the back of the top shelf or the bottom shelf. Placing them on the door isn’t a good idea as the temperature may fluctuate there. 1. Never wash any vegetables before you have to store them. 2. Always store mushrooms in a paper bag before placing them in the fridge. 3. Keep carrots, green beans, cauliflower and broccoli in plastic bags and place them in the crisper. 4. Winter squash and basil can be stored at room temperature. 5. Refrigerate stalk vegetables and herbs such as celery and asparagus standing upright in a jar of water. 6. Cutting off tops of beets and carrots extends their shelf life. 7. Keep garlic, potatoes and onions in a cool and dark place outside the fridge. The carton of eggs should be stored on a shelf in the fridge and not on the door. The best thing to do when it comes to meats of any kind is to cook it within a day or two. However, if for some reason you must store it, place it on the bottom shelf of the fridge. Food which has a fuzzy top has clearly been decomposing for quite a while and should be discarded immediately. However, sometimes even perfectly edible food is thrown out due to confusion about the expiration dates or an unwarranted fear of spoilage. In such cases, here is what you should do. The expiration dates or best by, sell by, use by dates mentioned on food packages are often just there to indicate the peak quality of the products. They have been put there by manufacturers and provide no indication of when they will spoil by. These dates can be confusing and are not the best way for you to determine if the product is still okay to be consumed. During such instances, use your eyes and nose to judge whether the food is okay or not. If it looks or smells off, throw it away, otherwise, it can still be consumed. You can save the food in the freezer if it is nearing the end of its edible existence. This is one of the easiest methods of preservation and will work with most foods. They can be stored in airtight containers with as much of the air removed as possible. You can also label it before storing so you remember exactly when it was placed there. Making simple changes in our daily habits can make a huge difference whether we realise it or not. By consuming foods responsibly, respecting the resources they take to produce and not taking anything for granted, we can fine tune our gratitude for having enough food. This allows us to work towards making a better environment for future generations.